Enjoy log-fire ambiance with none of the fuss when you install the Gazco Logic2 Electric Progress Fire. The contemporary, minimalistic look with sleek curving lines will complement any home decor. The exterior Iridium finish will give your living space a modern design update. The Logic2 Electric Progress Fire is easily installed in any standard fireplace opening or can be set flat against any wall with the optional spacer frame or a 3″ rebated mantel with a slip. This electric fire makes a warm, inviting centrepiece for any room without taking up floor space like other stand-alone units. Quality craftsmanship gives the Gazco Logic2 Electric Progress Fire a solid appearance as well as a 99 percent rating for efficiency. Choose between a realistic hand-painted log effect for a more traditional feel with white and clear stones or a grey pebble fuel bed to achieve a more modern design aesthetic for your home. 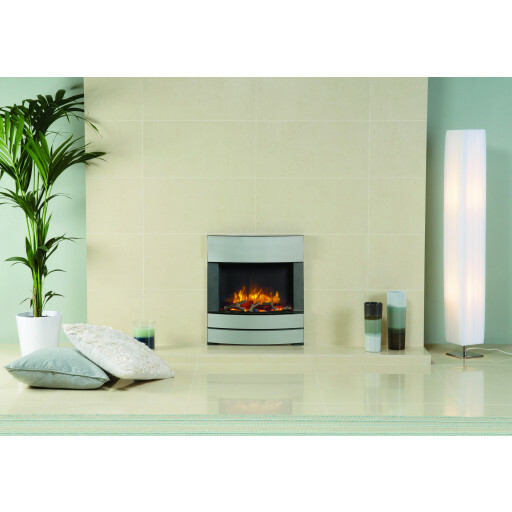 The Gazco Logic2 Electric Progress Fire uses advanced technology to control the unit. A convenient remote control lets you choose between two heat settings and two brightness levels with cool blue or deep amber flames. Enjoy the peaceful flame-effects setting at any time, or with a push of a button, combine it with a heat setting to warm up your living area.